Hi all! For those of you joining here this week for my "Growing In Unity" week, welcome! To those of you who are normal subscribers, hey! It's me! I'm still around! I know it's been a long time but I've been busy and without any crafting mojo whatsoever so I just took some time off to see if I could get it moving again. Turns out that it needed a bit of a jump-start to get going. Due to an immediate need to spend time with her family, this week's original GIU Gal needed to switch with someone so I moved to this week from the end of Sept. Nothing like forcing yourself to be crafty if it doesn't seem to want to come on its own. When I was planning my projects, I decided I wanted to use some stamps I haven't had the chance to ink. Then, I couldn't decide what style I wanted to make the card in so I jumped at the idea of making two cards for each day, both with the same stamp or very similar ones from the same set. It's been rather fun working on the two cards simultaneously. I kept these two rather simple because of the bold colors and images. The first one I inked the stamp, misted it with water and then stamped on dry watercolor paper. I wasn't entirely thrilled with the result so I did go back and mist the stamped image lightly to increase coverage. The second one was done the same but on damp watercolor paper. Pretty cards! Love the vibrant colors! I haven't used watercolor paper very much... must locate it in my craft room and use it! Congrats on your earlier-than-planned GIU week! Should be a fun week, and I'll be looking forward to seeing your creations each day! Beautiful! Love the watercolor effect, I can never get mine to turn out so pretty, guess I need more practice! Looking forward to sharing a great GIU week with you! 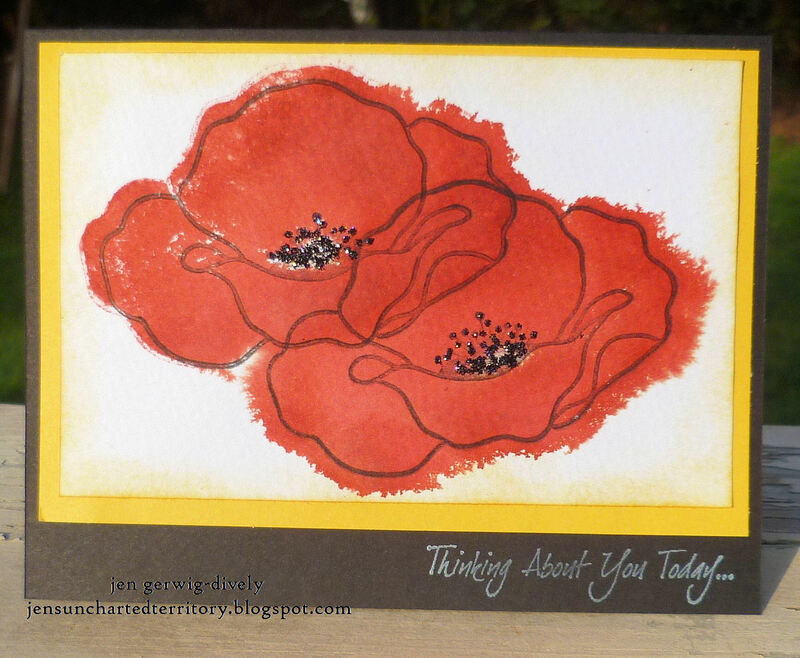 Your poppies look so very artistic! I like the "chalkboard" effect of the white sentiments, too. These are gorgeous! 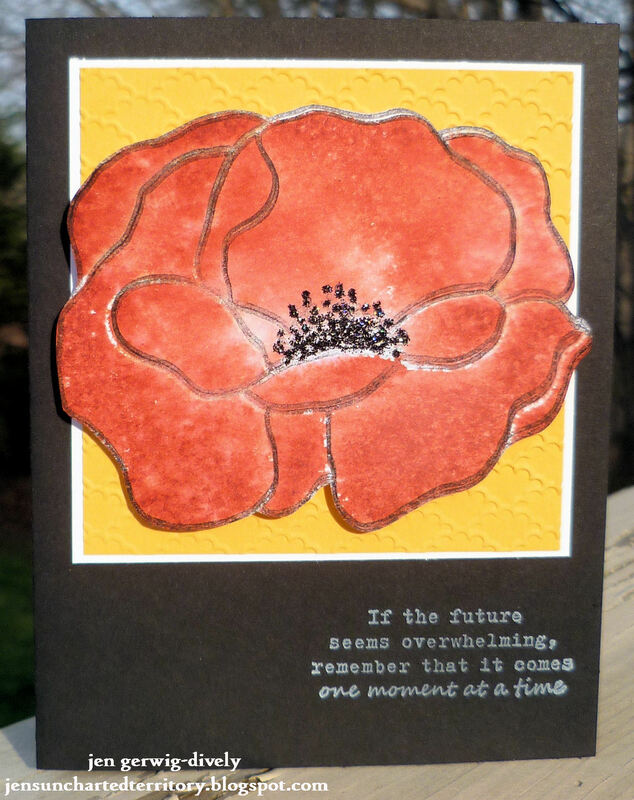 I have those poppies, but have yet to get them inky. Hmmm. Watercolor papers, spritz them. Ink those stamps. Hey, I think I can DO this! Thanks for the inspiration! BTW, I think I like the effect of the wet paper just a little better, but both are striking. Lovely effect you've achieved with this technique. Really love the gorgeous deep color you used on your flowers! The watercolor look is so pretty! These are beautiful! I think the second is my favorite. I love the two together and the back stamping. Ooooh, so pretty! I especially like the second one, the blurred effect. Very cool! 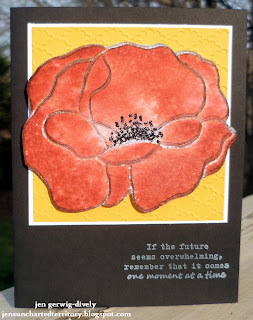 these are beautiful cards and I love the sayings or quotes u chose. Great job! Wow, they are so pretty. Love it. What a pretty watercolor look. What a beautiful bold flower and gorgeous color! Beautiful coloring of these flowers! Great cards! Haven't tried watercolor papers yet but I like your technique! These cards are so beautiful and I love the watercolored flowers! wow! what a great idea - love both cards! Thanks again for switching with me - couldn't wait to see your creations. Truly beautiful card..the flowers are stunning..loved looking at all your cards this week.